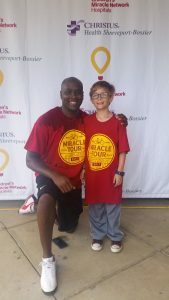 CHRISTUS Shreveport-Bossier Health System is hosting the second annual Miracle Tour on Oct. 6 at Haughton High School. Registration and check-in begins at 7 a.m. and the start time is at 8 a.m. 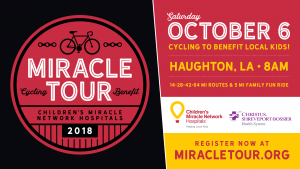 Miracle Tour includes 64, 42, 28,14 and 5-mile cycling routes to raise funds to benefit the 17 signature Children’s Miracle Network Hospital programs at CHRISTUS Shreveport-Bossier Health System and the community. countryside. Registered event participants will enjoy stocked rest stops, SAG vehicles on well-marked routes, and an event t-shirt, all while raising money to contribute to the medical costs of local kids. Food and drinks will be provided at a post-ride celebration. Riders who raise funds will receive great incentives including a 2018 Miracle Tour jersey and the chance to win prizes. Every dollar raised stays in Shreveport-Bossier to support the Children’s Miracle Network Hospital programs at CHRISTUS Health Shreveport-Bossier. The start and end of the cycling tour will be at Haughton High School. Online registration is $40 per cyclist and open through Thursday, Oct. 4 on their website. Participants will be able to register in-person for $45 per cyclist at the Carb Loading Dinner and Packet Pick Up at Great Raft Brewing, Friday, Oct. 5, and the day of the race, Saturday, Oct. 6, beginning at 7 a.m. The Family Fun Ride is $15 per rider. Great Raft Brewing in Shreveport is hosting the Carb Loading Dinner and Packet Pick Up for participants on Oct. 5 from 5:30 to 7:30 p.m. Registered participants will be able to to pick up their packets, meet local Children’s Miracle Network Kids and enjoy dinner catered by Panda Express, a partner of the local Children’s Miracle Network Hospital. To register for Miracle Tour, visit their website or call 318-681-6781.